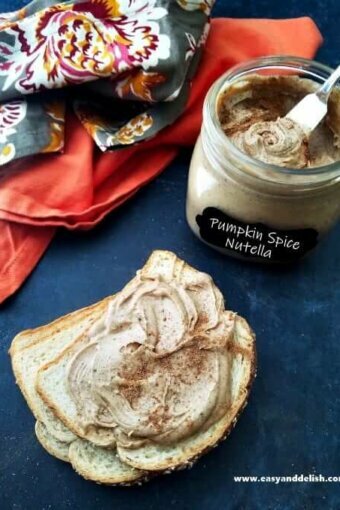 Learn how to make Pumpkin Spice Nutella from scratch in less than 30 minutes using only 6 staple ingredients. The spread for your toast and everything else! If you don't happen to find roasted hazelnuts in the supermarket, preheat the oven to 350°F. Then, spread nuts in a single layer on a large baking sheet for about 10 minutes or until nuts have browned and skins have blistered. Loosen the roasted nuts' skin by wrapping them in a clean kitchen towel and rubbing well to remove as much loose skins as possible. Let cool and don't worry about some skins remaining attached to the nuts! Melt the white chocolate, preferably in the microwave according to the instructions on the package...or alternatively in a saucepan over gently simmering water (i.e. a double boiler), stirring until smooth. Then, stir in 1 TBSP of oil and let cool a little bit. In a food processor, grind the nuts very well until they form a paste (about 4 minutes), scraping down the sides of the food processor. Add the remaining oil, sugar, pumpkin spice, and pumpkin pie extract or vanilla. Continue processing until the mixture is smooth. Add the melted white chocolate and process well until getting rid of any chunks of nut that remain. Place into a clean jar and let it cool at room temperature in order to thicken. Cover the jar and store at room temperature for up to 2 weeks. Enjoy on toast and on/in whatever you like! Wondering how to make Nutella without hazelnuts? In a medium non-stick pan, toast 1 cup sunflower seeds over medium-high heat, stirring/tossing often to avoid burning. Remove from heat and allow to cool completely. Then process toasted sunflower seeds in a food processor for 2 to 3 minutes until seeds have turned to a thick, creamy butter. Follow the rest of the recipe above. How about a healthy Nutella? Use 1 cup roasted hazelnuts, 1/4 cup milk of choice, 2 TBSP coconut oil, 3 TBSP pure maple syrup, 1 TBSP pumpkin spice, and 1 tsp pure vanilla extract. Process the nuts in a food processor until they turn to butter, then add all the other ingredients and process again until it’s smooth like Nutella.